It’s winter time, and you’ll choose a water heater as it’s a need. Chhaperia is on the top-list of electric water heater rod and coil suppliers. Though core competency is in place, our efforts on the units we produce have made us remain unbeatable in the industry. The electrical heaters work with the defined principle, and our services have reached to the world corners. We ensure perfect condition for the system before it reaches the customers. The rod restricts the flow of electric current by applying high resistance. Through the application of high resistance, the coil begins to heat the water. Coil, the conducting material has Nickel (80%) and Chromium (20%). More the number of turns, more the heat is generated in the coil. The ever-increasing demand for electric water heaters made a path for Chhaperia to manufacture the best heaters. 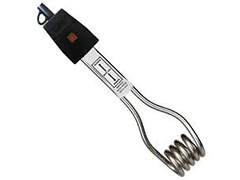 However, we continue as an electric water heater rod and coil suppliers as well.